Our recommendations for lunch and dinner in Myrtle Beach, South Carolina. Loved the creative shapes of the menus! They also serve specialty cocktails which are cooled with liquid nitrogen, making them into smooth, frozen treats, kind of like sorbets. 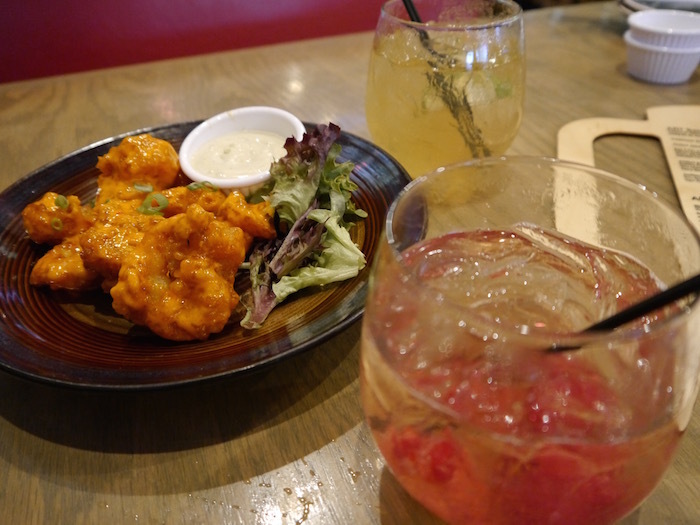 We ordered one to share as dessert, but for our first round, we each ordered one of the house’s signature cocktails, which we drank with our appetizer of spicy firecracker shrimp. Then we ordered a crapton of sushi – that’s a technical term. And yes, we ate every piece. We got to meet the manager of ART Burgers and Sushi, who told us about the inspiration behind the restaurant’s decor. 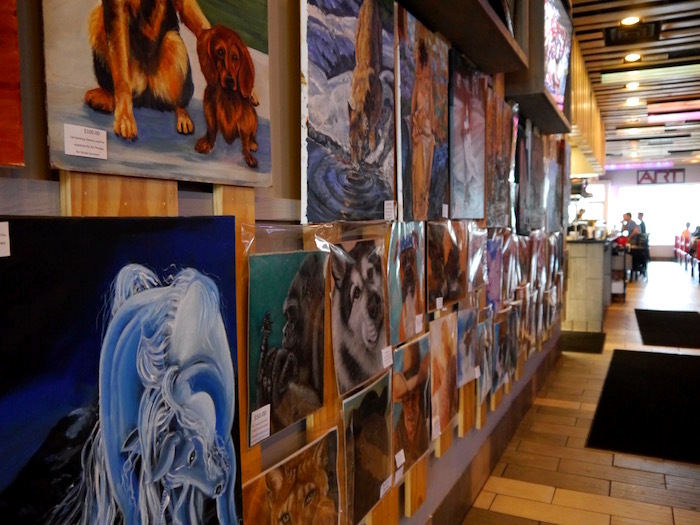 All of the art is available for purchase and created by local artists, who don’t have to pay any rent to show their work there! Lots of thought went into the smallest details, like the wooden planked ceiling, which is intended to be reminiscent of bamboo mats used to roll sushi. Super neat! By that night, we’d barely recovered from our sushi feast by dinnertime, but we sucked it up, got dressed in our finest night out attire, and headed to Thoroughbred’s. 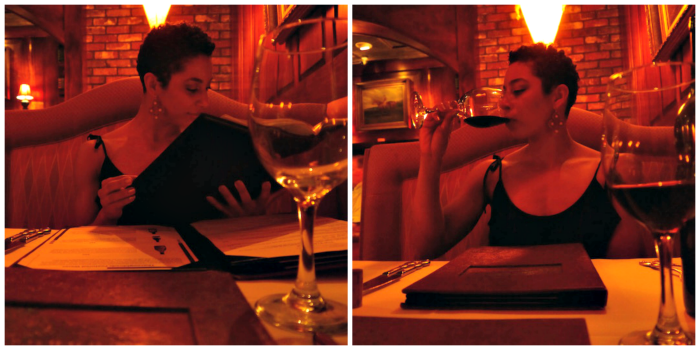 We were “warned” that it would be an amazing meal, but it was even more delectable than we could imagine. The lighting inside Thoroughbred’s is moody and dim; so will my pictures be. I tried and failed to brighten the pictures up so that you could see the entrees better, but decided I would rather it be a little dim and show the romance of the restaurant. We started with a bottle of Malbec since we both like dry and spicy reds. Our server adeptly suggested both of our entrees and we were not disappointed, to say the least. 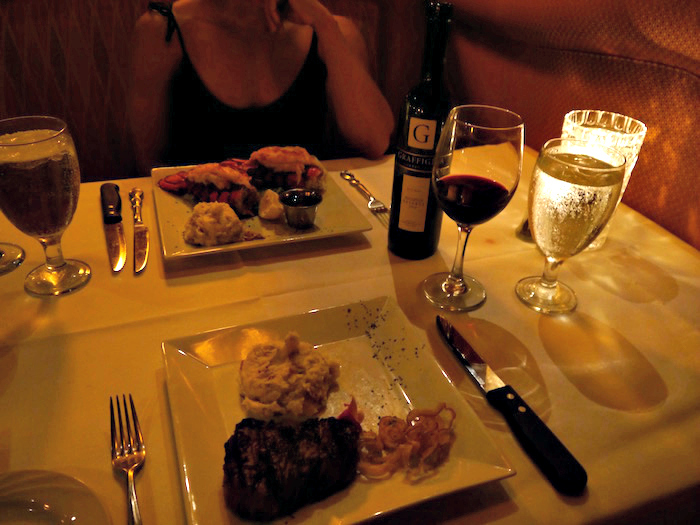 I had twin lobster tails with mashed potatoes, and my sweetie ordered the most delicious filet mignon either of us have ever had. Seriously. It was coffee-encrusted but tasted nothing like coffee – instead it had a beautiful nutty crunch on the outside and of course, a moist, juicy inside. We still dream about it. If you go to Thoroughbred’s you MUST order it. 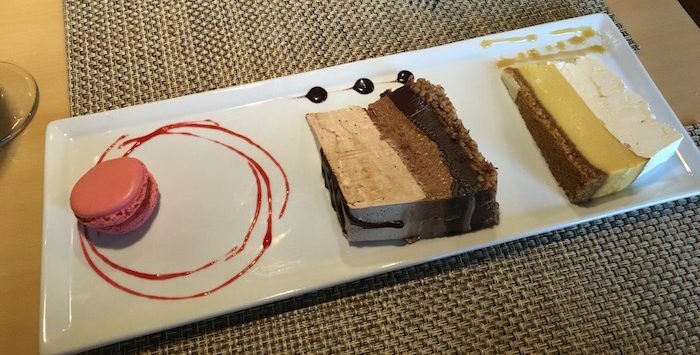 We didn’t have room for dessert, but you’d better believe we ordered it anyway. We chose a triple layer chocolate dessert and a slice of cheesecake. Look how happy I am about it! After passing out that night in food comas, we woke up the next morning ready for our next culinary adventures. 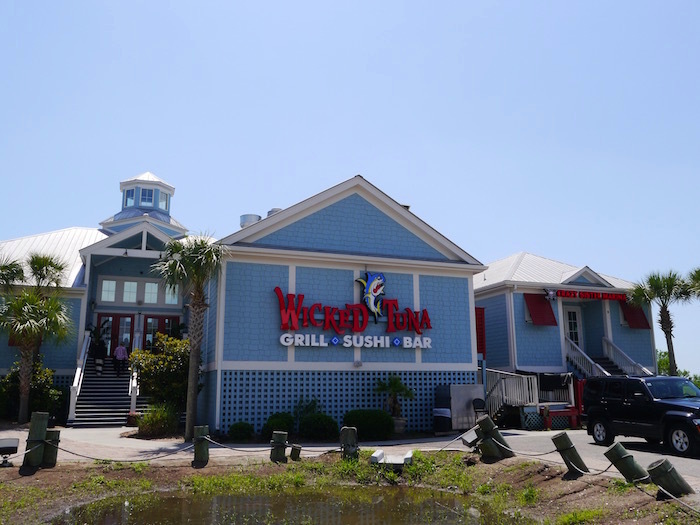 Our first stop was Wicked Tuna for lunch. It’s right along the water and we were lucky enough to be there on a gorgeous, clear day. The interior is light and beachy, especially the patio, which has a sailboat theme. We’re guilty of ordering sushi again, even though we’d had it for lunch the day prior. This time I branched out and ordered a surf and turf roll, which had steak on top. Not as scary as it sounds! Our server was nice enough to take our picture in front of the beautiful water. He sarcastically remarked, “Jeez, maybe you guys should hit the gym sometime.” Ha! 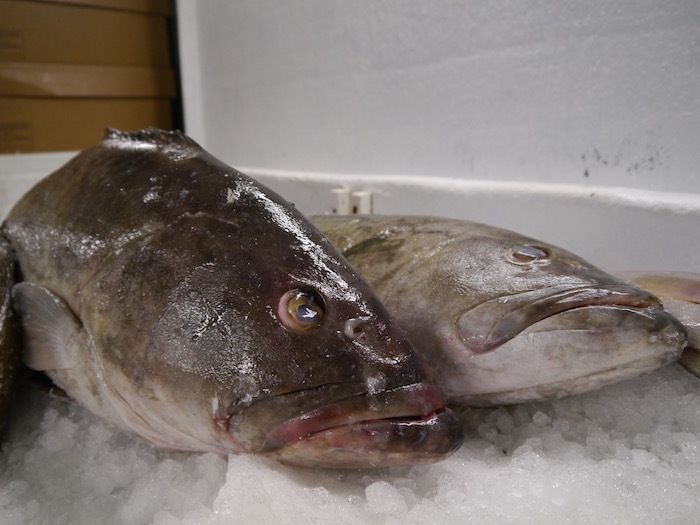 After our meal, we were treated to a special behind-the-scenes tour of the fish preparation cooler area. 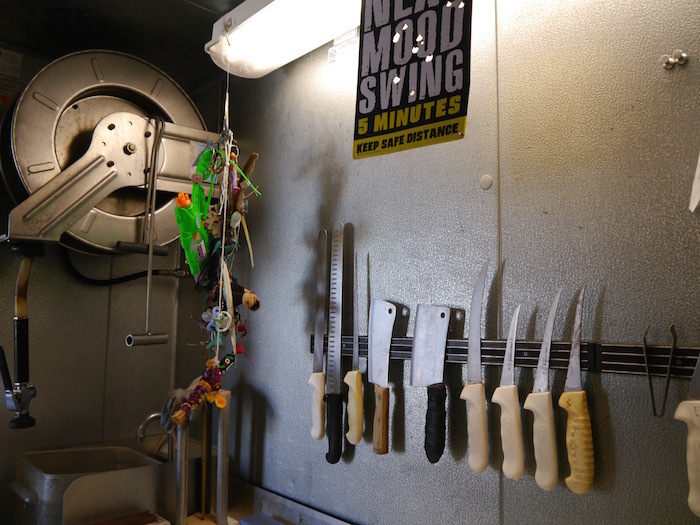 Chef Dylan told us all about the boats that catch fish especially for the Wicked Tuna and its family of restaurants. 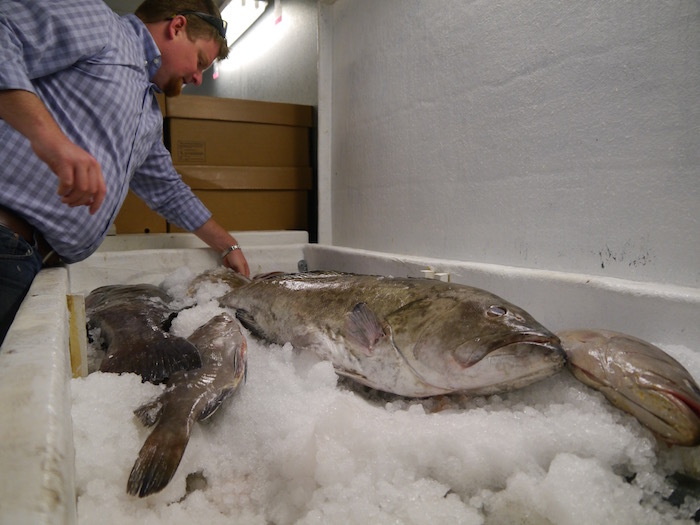 The ice they use is a special kind of ice pellet that is softer and melts in a way that doesn’t damage the flesh of the fish like other ice cubes would. Our last dinner in Myrtle Beach (such a sad occasion!) was at the delightful bistro called Croissant’s. As you might be able to guess from the name, their fare is French-inspired, and their slogan is bonjour, y’all! We made the excellent decision to order the brie en croute for a starter. 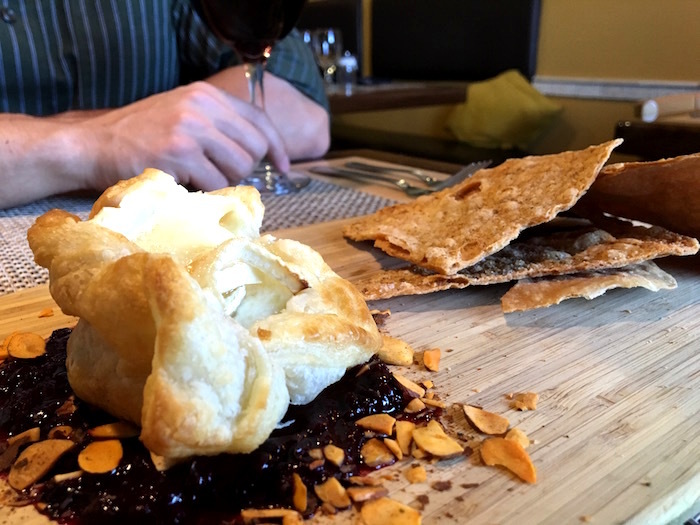 The baked brie came with hearty whole wheat crispbreads, warm berry compote, and toasted slivered almonds. 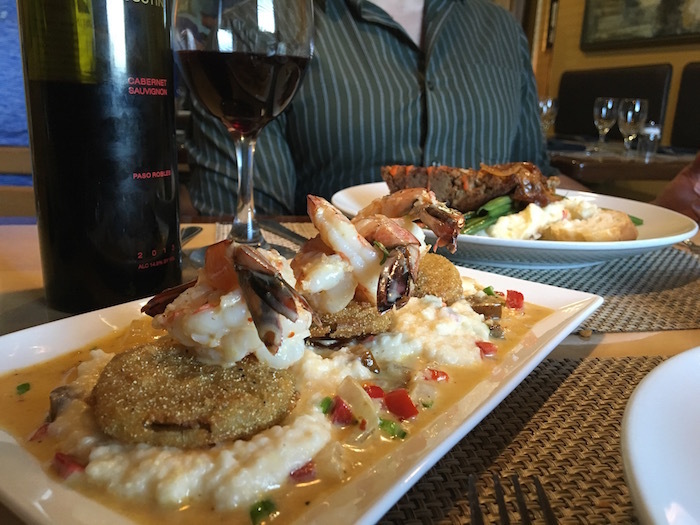 Our server also recommended the shrimp ‘n’ grits, so we also ordered that along with our entrees: meatloaf for my honey and bleu cheese filet with horseradish mashed potatoes for me. Much to our surprise and delight, the manager treated us to a sampler plate of three handpicked desserts from their robust dessert selection. A raspberry macaron, a chocolate mousse dessert, and key lime pie. Can you believe all this food we ate?! Thank you so much Susan and Visit Myrtle Beach for treating us to these wonderful meals. 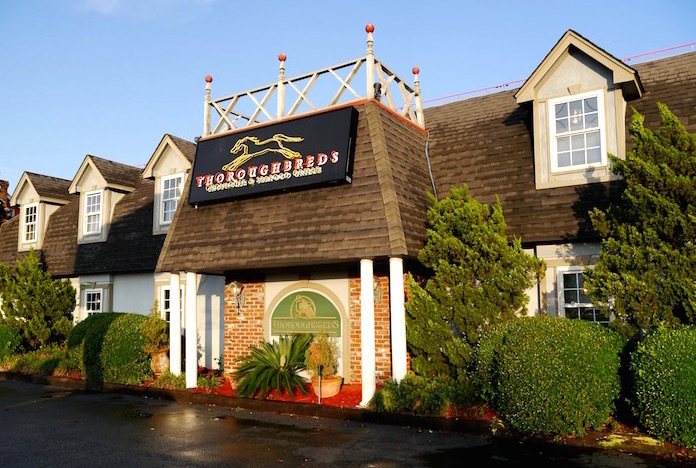 If you are visiting Myrtle and looking for somewhere fabulous to eat, we’d recommend any of these four Myrtle Beach restaurants, but especially Thoroughbred’s Chophouse. Order the coffee-rubbed filet and thank me later! I’ve always heard about Myrtle beach. This looks like an amazing place to visit. Love the photo journal esp the artwork on the wall. Foodie brilliance! Wow all of this food looks amazing! Those spicy firecracker shrimp are right up my alley – but maybe chicken because I can’t eat shrimp haha the sauce looks good! You guys ate a lot os sushi!! I am so jealous because I love sushi. There are tons of wonderful in Myrtle Beach — I too would pass out in a food coma there. Myrtle Beach trip sounds like a wonderful place to visit & it always feel so good when you get to enjoy the best of delicious foods as well. The pictures are amazing & I am sure you have had a wonderful time. I would love all those sea foods anytime! 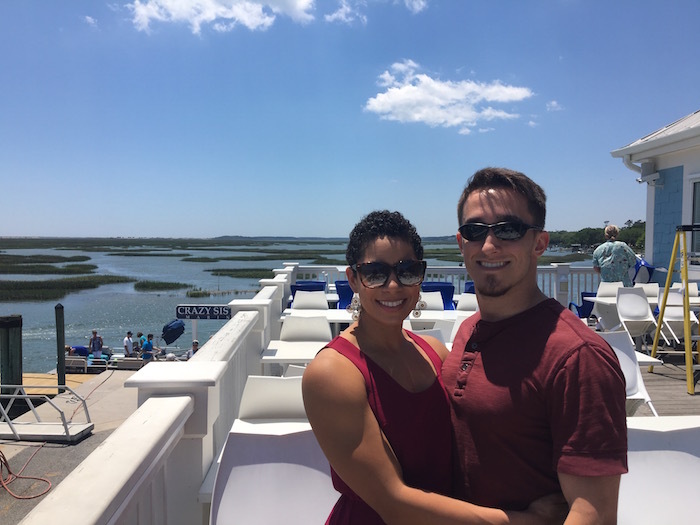 Myrtle Beach is a fantastic weekend getaway – and we LOVE to know the great eating spots when we do a beach weekend getaway! Awesome suggestions – thank you! Oh gawd so many delicious places to eat! lol You and the “younger man” look adorable together! This is why I’m not so good with food posts because I end up getting hungry while reading it, especially when it’s a post like this! Look at that spread of food, the sushi platters are enough to get you going, what more if you add steaks and desserts! 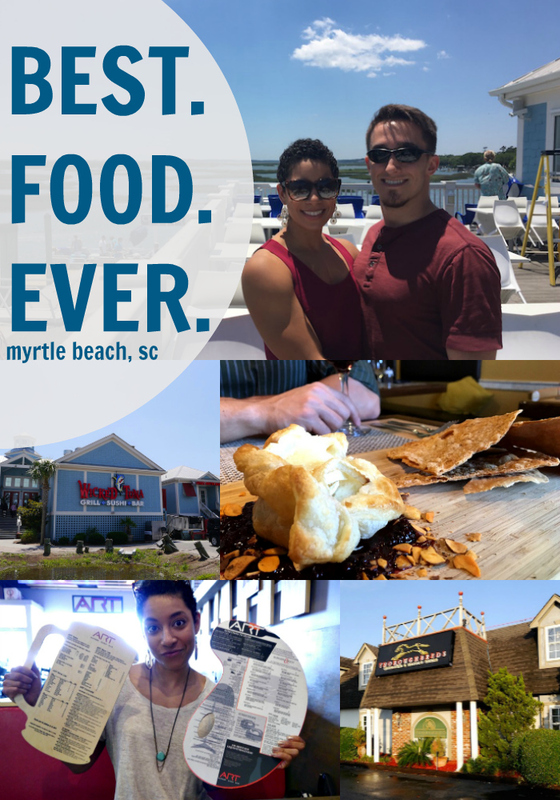 What a food journey in Myrtle Beach! 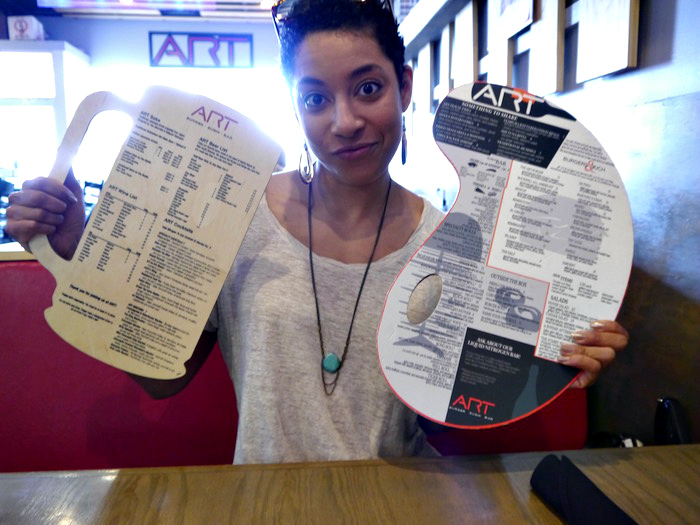 I just loved the art shaped menus too. Will need to make a visit to Myrtle Beach to check out the sites and foods. Your resto recommendations are just super nice – good job. I gotta give the owners props for taking tikme to dress up their restos. I love the facade + the interiors. Both are well thought out so one could pretty much expect great food as well. The food looks amazing from both restaurants! That sushi made my stomach growl looking at it. The cocktails, the desserts, me likey! Wow what a feast. Now that’s a vacation that I’d want to take. It’s really nice when you get to enjoy vacations like these. I agree with you, Kathy. I love vacation destinations that have a little bit of everything. It makes your time there all the more enjoyable. I love burgers and sushi so that restaurant would have been right up my alley. I’ve never been to Myrtle Beach but I would love to spend some time there. OMG lots and lots of food. It all looks lovely though especially that sushi! You have a great taste in food! I like to try all of these, thanks for sharing your experienced! Oh, you are so lucky to try these foods! I love to go to Myrtle beach too and taste these awesome foods. This is torture, seeing such beautiful meals and not having the chance to try them out. Especially that sushi and the Brie en Croute, can’t believe that was a starter looks like the main course. We love seafood, so I am sure we would find plenty of good eats in Myrtle Beach. My husband would eat the heck out of that Sushi. Im so guilty of planning my vacations around food. haha I love the beachy exterior, perfect ambience! The food looks amazing. I am so hungry now. Lovely post. Ooh sushi and and cheesecake are two of my absolute favourites so this restaurant looks like it’d be perfect for me! I love how you were able to get a behind-the-scenes look of Wicked Tuna. Learning how different industries work is so interesting to me. You ate a lot of sushi and just by looking at the photos and reading about it has helped me decide what I’m having for lunch today – thanks! I have been dying to get to Myrtle Beach and have yet to make it. It’s been on my list of vacation must see spots for a couple of years now. Is Wicked Tuna a chain? I think it must be because I am pretty certain I spied a spot like that in Martin County Florida recently. Now I am wishing that I had stopped there instead of the spot we did have dinner at. The sushi looks amazing!! I think you are hilarious with the cheesecake comment. We were too full too eat any more but we ordered it anyways. LOL. We really need to go for a visit again soon. It has been forever! There really is so much to do and see. We’re actually in the middle of planning a getaway to Myrtle Beach so this list comes in handy. That sushi looks amazing! It sounds like you found some interesting mix of flavors. I have to agree…I absolutely love the creative shapes of the menus for the Art choice. Thanks for sharing. I have not been to Myrtle Beach in a few years. It is time to go back and visit some of these amazing places. Those fish are huge. I’ve never seen any that big before. All of the food looks delicious and I’ve now added Myrtle Beach to my bucket list. I’m drooling at all of this, now this is my type of vacation. One where you go on a food tour of sorts. Really freaking cooling, that sushi looks so good. I’ve not had any in a while. The beer shaped menu was a cute touch. I would like to try the desserts specially the Raspberry Macaron. Wow! These places sound great. We actually had Art Burger when we went. Their food is so delicious! I hope to visit myrtle beach again so that we can visit some of the other places that you named. You guys are a great-looking couple! My hubby and I really love sushi. I am bookmarking this page for future travel reference – thanks! Takes me back to my holiday at Myrtle Beach! The Key lime pie and the cheesecakes look very indulgent…and delicious! i have always waned to go and visit South Carolina, or not just visit but stay there a bit longer and explore the coastal area. All so delicious looking! 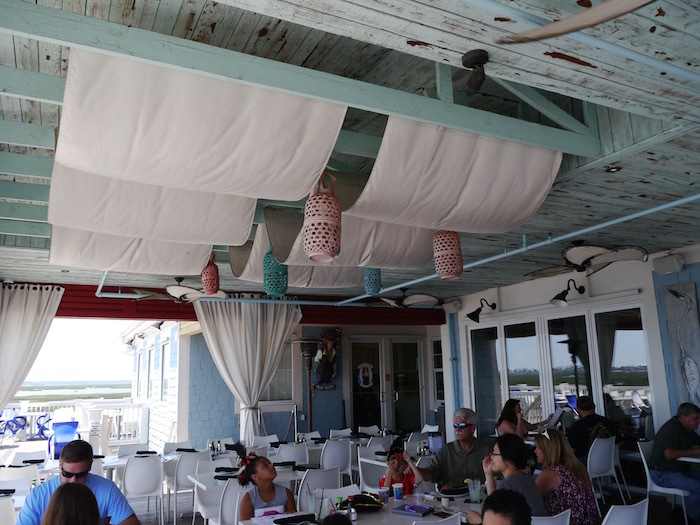 I love those lanterns and the way the ceiling is done at Wicked Tuna. Oh my goodness, the food looks AMAZING!! I’d love to try the shrimps and grits. I have no idea why, but it’s just something so far from British food that I want to see what it tastes like! Oh my! Look at all that sushi. I think I am going to have to go and get some sushi for lunch today. These all sound like amazing places to eat in Myrtle Beach. At the Thorourghbreds the filet mignon crusted in the coffee sounds interesting and I would definitely try that for sure. Thanks for sharing these awesome place to eat. Wow those dishes all look amazing. I am dying to try that filet mignon! Man, everything looks incredible! I would need to stay in Myrtle Beach for like a month to be able to find the best spots. Thanks for narrowing it down for me (but I still may need to spend a month there!!!). My mother went to Myrtle Beach and loved it! Some day I’ll go there to check it out myself and I’ll have to come back to this post to make sure I eat that fantastic looking food you shared with us on here! I live in SC and love going to Myrtle Beach. There are some great restaurants, but I swear the only place with more themed restaurants than MB is Las Vegas. I’ve never been to Myrtle Beach but it looks like an amazing place! 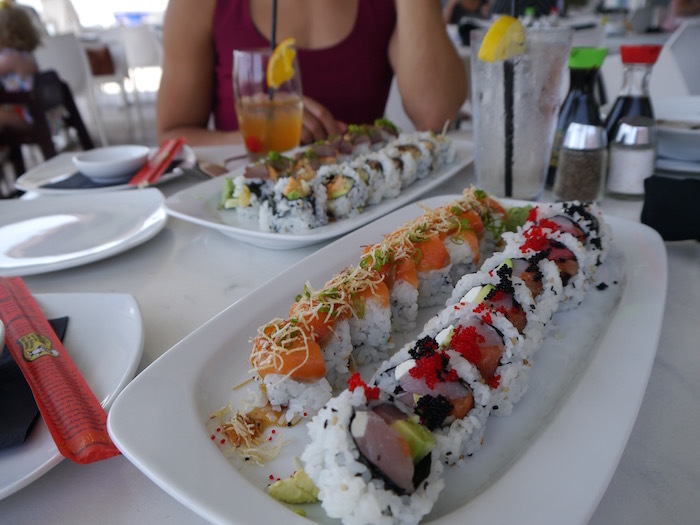 I loved those sushi and feeling like grabbing it right now! I’ve never been to Myrtle Beach and it would be nice to go there and just go to all of these lovely restaurants! This whole post made me crave for sushi. They all look delightful thought! Looks like you guys enjoyed yourselves at Myrtle Beach. That’s fantastic! It seems like i visted myrtle beach without leaving my home. Great pics and experience. Love it! All of this food looks incredible! My sister has visited Myrtle Beach many times and always raves about it, and the food! Now I see why. What a fun, fun time! This is someplace I’ve always wanted to visit. Now I REALLY want to go. The horseradish potatoes get my vote! Never thought Myrtle Beach was a foodie destination but your post made me so hungry (and maybe a little jealous). All that glorious food! I agree, crapton of sushi is a technical term. I think we use it too lol! And that lobster. Yum. And no judgements here – I always order dessert even when I can’t breathe anymore from too much food ha! I can never resist. Myrtle beach is so high on my list of places to visit! Bookmarking this! Wow it looks like you went some amazing places. I have never been to Myrtle Beach but now I know where to eat when I make it there! i will have to bookmark this for next time we are in that area. i love myrtle beach! Wow! That looks amazing! Every single bite! I haven’t been to Myrtle Beach – but at least now I know where to eat when I do! I’m saving this post! We’re heading to Myrtle Beach later this year and I’ll need to eat all the sushi! I could eat sushi all the time. It’s so much fun trying out the different kind of rolls, even if I still order my fav. Looks like there are some really unique eats and cocktails to check out in Myrtle Beach. Everything looks so good! Can I please have it all? Or at least the sushi? No. Argh! Sounds like you had the most amazing place and all those delicious places to go to eat YUM! Sounds like you guys had a great time. All the photos are incredible!! Love these! Omg so many delicacies you guys must have had super fun devouring. Liked the surf and turf roll and the sail theme looks awesome. Myrtle beach looks like has some great restuarants. Sounds like you guys had a blast trying at all these different restaurants. I would love to do something like that. Next time I’m out that way I will have to check out these restaurants. I love these foods. What a fun way to spend your time! I like the menu from Art. What a fabulous place with plenty of places to eat & dine. I’d love to visit Myrtle Beach with the whole family. The meals & the views of the water would be amazing! I love sea food. Not a big fan of sushi but please give me those desserts. Love the food photography you have done. Look at all that delicious food! We love Myrtle Beach! It was one of our favorite places to go. Looks great! I’ve never been to Myrtle Beach but I’ll have to keep these places in mind if I ever go! Oh wow everything looks so wonderful! I hope to get to Myrtle beach with my family someday to experience the great eats! I’ve only been to Myrtle Beach on one occasion, but I’d love to get back there. The ocean is gorgeous, and the shops are wonderful. Thanks for sharing this restaurants for the next time I get there. There are so many places to eat in Myrtle Beach, it can be hard to decide where to go. 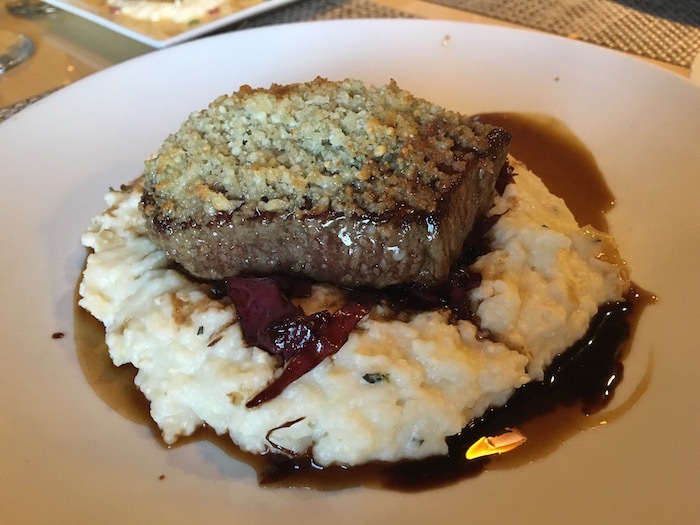 These are great options, that coffee encrusted filet at Thoroughbred’s sounds delicious. Nothing wrong with having sushi 2 times in a row. I would do the same! Myrtle Beach is one of our FAVORITE vacation spots! We haven’t been in years (moved to Texas), now I want to go! Love the food…beautiful pictures BTW! 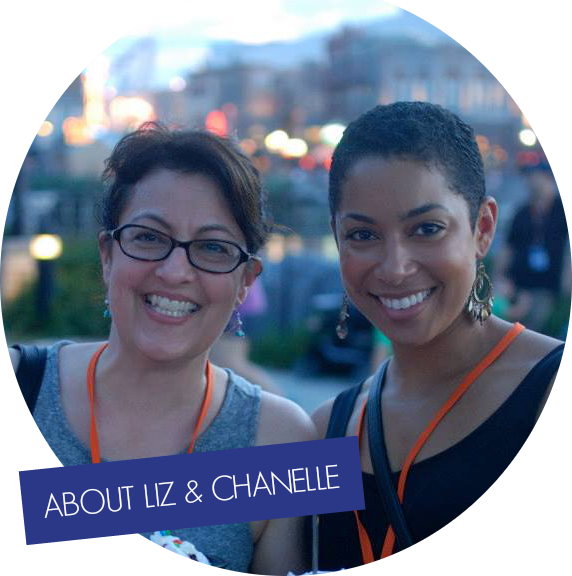 Oh my, what a fun foodie adventure! Thanks for sharing, I’ll keep those in mind when we make our way down to Myrtle Beach! So many good eats! I love the picture by the water. And my favorite of all you mentioned, and I’m not afraid to say it 😉 is the Key Lime Pie. Oh yes, I do want a slice of that pronto! If I ever manage to get to Myrtle Beach you will definitely find me at the Thoroughbred’s Chophouse. I really want to try that coffee-rubbed filet -it sounds to die for!! Of course lobster tails I would never refuse! The food all looks so wonderful. The places all books so beautiful. Having great places to eat makes a vacation spot event nicer. I would be all about that sushi too girl! Looks like y’all had a great time. I am definitely putting Myrtle Beach on my radar for early 2017. It sounds like you had a great weekend with lots of great food. I’m a little hungry after reading this post. All of this food looks amazing. I have been to Myrtle Beach one time years ago and it was a lot of fun. I would love to go back. I’ve never been to Myrtle Beach, but would totally go, just based on your pictures! The atmosphere looks amazing, and the food has me drooling! I am ready to head to Myrtle Beach. But, not for the sun and sand, for the food. I need to try all your restaurant suggestions. My husband would love Wicked Tuna. There is a really good chance I will be in Myrtle Beach next summer (because my sister in law is moving to SC this summer), so I am really excited to try Thoroughbred’s! Looks soooo good!! I am a big fan of seafood and will have to try it when we go to Myrtle next time! Love sushi! Looks like some great finds in Myrtle Beach. Never been there, but I’ll save this for later though. Everything looks so good! I wish I could make a quick trip to Myrtle Beach and get some yummy food. Everything looks amazing…but the sushi and the steak definitely look sooo good! Love your pictures! Everything looks amazing…but the sushi definitely is the winner for me! I have a bit of sushi love problem! 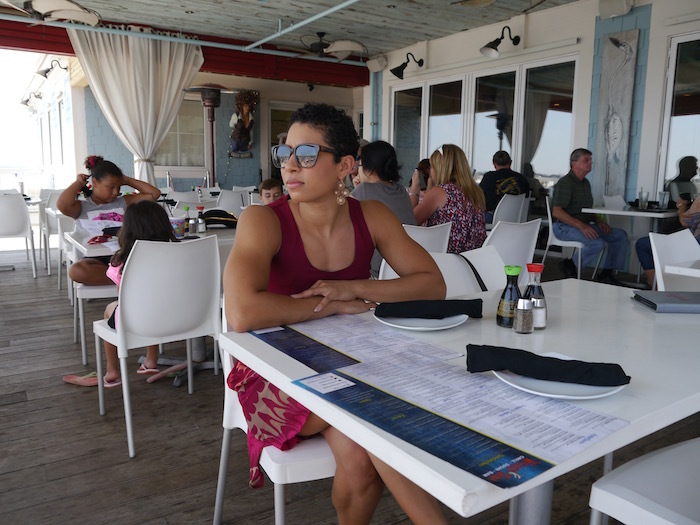 I love the atmosphere and setting of the Wicked Tuna too…it looks like a great place to eat! That sushi sure looks yummy! I don’t think I would be able to eat all of it, but I would certainly try! OK so i am loving this post. i loveee your pics it look like you guys had a great time. I am so jealous! 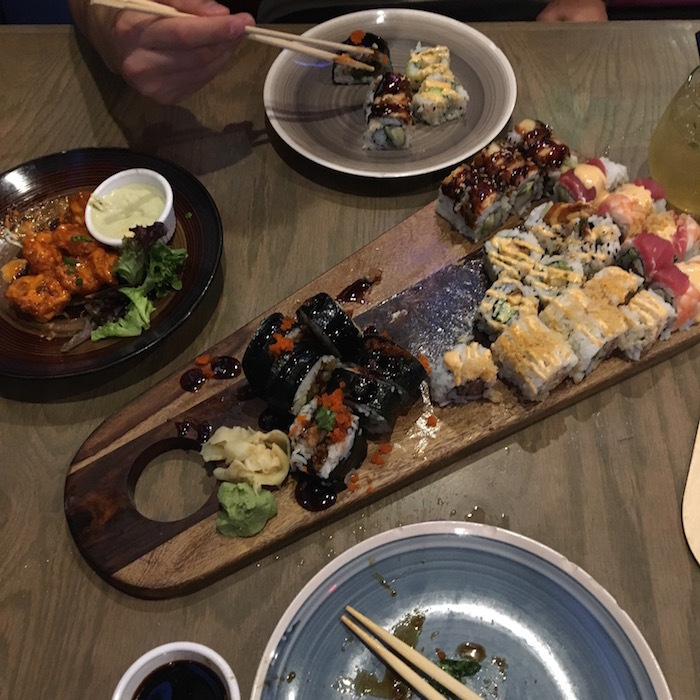 Everything looks amazing and oh my gosh, that sushi! I’ve been wanting some for a few weeks and now I just have to get some. Next time we visit there we will have to check these out. It all looks so good! Thanks for this great info. I actually knew about most of these. We go to Myrtle Beach whenever we can. The dining there is amazing. Wow, all that food looks wicked good! Seriously, you chose some fab bites, and you look like you enjoyed every second! I love all the different food options that Myrtle Beach gives you – I could eat for hours!